When it comes to quality, you are going to find that the Dewalt miter saw stand is going to be one of the best options that you are going to have. With this tool, you will find that there are a number of impressive features and coming in at only 46 pounds it is lightweight enough that anyone is going to be able to handle it. What you are going to find is that this Dewalt miter saw stand is setup to work with any brand of saw. It is not limited to those in the Dewalt name only. Along with that is the aluminum construction that is going to help you to effectively use this tool, without having to lug around a heavy unit. This of course makes it an exceptional choice for construction sites. Along with this, you are going to find that the legs are designed to fold easy, which is going to help with making storage easier. Of course, this is coupled with the fact that the unit can handle 400 pounds, which is going to make it an effective choice for those who handle heavier materials as well. The overall dimensions of this unit are 75x11x8.75". Before you choose to go out and pick it up, you will want to be certain that it is going to fit properly in your workshop. When you are looking at the Dewalt miter saw stand, it is important to note that it isn't a bad unit at all. However, it isn't without problems as well. From the standpoint of what works, you are going to find that if you have repetitive cuts, the setup is actually designed to work well with the saw that you have. Along with that, the unit is very stable and can be moved very easily without much trouble at all. That makes it a very effective unit for the price, which is also good for the type of unit it is. Now, the Dewalt miter saw stand does have its own set of problems. For one, most people are going to find that the supports on it are going to prove to be very ineffective. Along with that, you are going to find that if you are using a bigger blade, there can be issues with squaring and there is a potential for having a series of problems starting up as you begin to do cuts on longer pieces of molding and other pieces of wood. 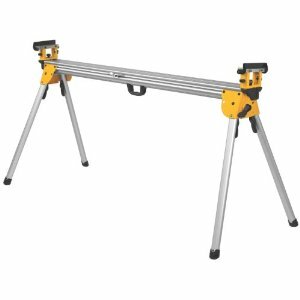 All in all, the Dewalt miter saw stand is an acceptable saw, depending on what your needs are going to be. Just like any unit, it does have some pros and cons attached to it. While it does prove to be a very effective choice for those who have a basic understanding of how these items will benefit them. Just remember as you look over all your options, it is important to keep in mind that you are going to want to consider the overall quality of the Dewalt miter saw stand, which in this case happens to be very good. Return to Tool Reviews Page..
Return From Dewalt Miter Saw Stand Page to Home - Finishcarpentryhelp.com.